In 2014 a friend of mine, Pat Bannister, held a charity event, in aid of cancer, in her son’s garden. Of those that attended many donated a 12½” patchwork square. These squares were hung on a long washing line and made a colourful display. Afterwards, Pat and her friends set to and made them into quilts for Project Linus UK. 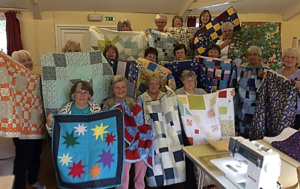 The Pludds Quilting Group from the Forest of Dean, Gloucestershire is a self-help group of quilters who meet on the third Tuesday of each month to sew and chat. Last year their community project was to make patchwork quilts for Linus and recently handed over 18 quilts they had made for sick and traumatised babies, children and teenagers. They would like to thank residents of The Pludds and other people who kindly donated fabric for this project. I would like to say a very big thank you to Project Linus for the quilt. My 17-month- old son was admitted to hospital on Christmas Eve, but despite being unwell, he was so excited when he saw his Thomas the Tank Engine blanket. It was such a lovely and thoughtful gift, thank you for putting a smile on all of our faces. Your hard work is greatly appreciated. We were fortunate to receive a grant from The Big Lottery last year. I was assisted in the application by Doreen, our treasurer. I had been contacted by Paula from Warrington Volunteer Support Services (WVSS) who suggested we apply to The Big Lottery following a previous failed application for local funding. We were looking for some money to restock some of our fabric and wool. Our group had grown to forty members and so the stock doesn’t last very long. This is despite members using some of their own stash. We normally have a couple of fund raising events a year plus whatever donations we manage to receive. We then use this money to buy wool and fabric to make more quilts and blankets. We had hoped to maybe get a few more rulers and equipment too as these things need to be replaced at times. Our group meet once a month in the Methodist Church Hall and on those days, we dedicate our time to Project Linus work. We have some equipment that is available for newcomers to use. They invariably buy their own equipment when they get “hooked” on patchwork and quilting and they want to do more at home. Our knitters are happy if we keep them supplied with wool and have declined offers of getting a knitting machine. We don’t set targets on how many each person makes or how many a year. We accept that people have either jobs or other commitments and we all work at a different pace. Paula emphasised how much support we were giving to the local community as well as the recipients of the quilts and blankets we make. Following Paula’s advice, I asked members what they felt they gained by being a member of the group. We had some very positive remarks back. We were having four meetings a year when we would share a new or different technique, meeting like-minded people, giving something back to the community, sharing and growing, increased knowledge of a hobby. People living alone commented on meeting lots of smiley faces, making friends and giving and receiving support. We had several meetings with Paula who encouraged us to ask for more than we originally intended. She suggested we considered larger items but at the time the only thing on our wish list was a Long Arm Quilter. This would have meant renting accommodation to store and use it which was unrealistic. 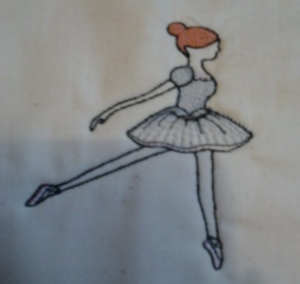 After much thought, research and consideration we eventually decided to ask for sufficient funding to buy an embroidery machine. Although I had no personal experience of these machines one of our ladies did and had used hers to sandwich some of her Linus quilts together and they looked so beautiful we thought this may be worth a try. Doreen and I worked together to identify what we would ask for. We encouraged the knitters to explore different types of needles etc. but all they wanted was some nice wool to work with. We found quite a few things that would enable the sewers to improve and speed up the making of quilts but the embroidery machine was the main item we asked for, something we would never have raised enough funds for on our own. The research and planning of our application was quite time consuming and seemed to take forever but eventually Doreen and I had another meeting with Paula and we agreed the application should be submitted. There was a period of about six to eight weeks when we had to wait for a decision to be made. I then received a conditional grant offer and completed the necessary paper work but at this stage we were not to make the offer public. We had to wait till The Big lottery gave a date when we could go public. We have one year to spend the grant money and have to have receipts for all purchases to prove the grant has been spent as we had intended, should anybody need it. The Big lottery emphasise the importance of publicity to both promote your own project and to let National Lottery players see were the money they raise is spent. We named our project “A Hug in a Blanket” one of Linus sayings. They give lots of free plaques, stickers and other items and guidance. Since receiving the grant we have so far bought lots of the things we had planned. Whilst at a Stitching and Craft weekend I saw a similar embroidery machine to that I had researched. There was £200 off but for that weekend only. A few more committee members went to the show the next day to check it out. 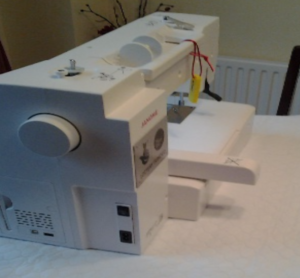 In the meantime, I had spoken to a more local sewing machine supplier, Bambers, and they said that in view of us being a Project Linus group they would give us a further discount. Needless to say, we spent that on embroidery threads with them and we will be longstanding customers for them. We are at the very early stages of a steep learning curve, trying to learn as much as we can about the designs and the machine etc. Several ladies have made samples of the different patterns that are available. Some of our ladies feel a bit daunted (myself included) but when they watch us using it they are fascinated and pleased with the results. We plan to let everyone have a go over the next six months or so. Some of the knitters are keen to do appliqué motifs to go on the corner of their blankets. There are quite a few ideas buzzing round the group on the things we can do so watch this space. This was a fitting piece of equipment for the group to acquire on our 10th birthday year.I appreciate this is not suitable for all Linus groups, more so for community based groups but I would recommend other groups explore the possibility. “I thank God for the wonderful hearts you have to help those in need. It was lovely to meet you and relieve you of all the quilts, bags and baby knits! All the quilts were put into the appropriate age bags and delivered with the food hampers. They were a great addition to our hampers and were all very gratefully received. We’ve had great feedback from clients and workers about what a difference they made. One family I delivered to, the dad said they didn’t think they would be able to give the children presents and now they would each have their own bag with a quilt in!”.